Legal Topics - Community Legal Aid Society, Inc.
Below you will find links to information concerning CLASI’s practice areas. While you may find this information instructive, we strongly recommend that you consult with an attorney concerning any pending legal problems that you may face. To obtain assistance you may contact all three Delaware legal services programs (CLASI, Legal Services Corporation of Delaware and Delaware Volunteer Legal Services) by calling Legal Helplink at 478-8850 in New Castle County or 800-773-0606 in Kent and Sussex Counties. If you believe that you are not eligible for free legal services, you can obtain a referral to a licensed Delaware lawyer by calling Delaware Lawyer Referral Service at the same numbers. Information and links concerning the rights of tenants living in private or publicly subsidized housing in Delaware. Information and links concerning public benefits programs such as A Better Chance, Food Stamps and SSI. Information concerning protective orders and child custody and visitation. Information and links concerning immigration services. Information and links concerning consumer rights and bankruptcy issues. 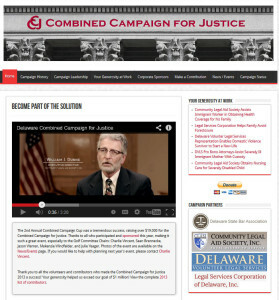 Information and links concerning legal problems confronting aging Delawareans. 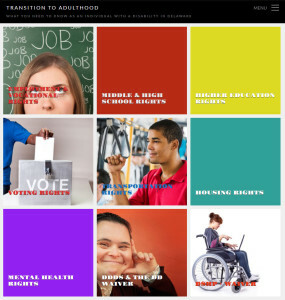 Information and links concerning legal rights of people living with disabilities in Delaware.